Synthetic sports surfaces, including artificial grass tennis courts and cricket wickets, are also one of our focus areas here at Surface-it. An artificial grass sports surface is so much kinder on the lower limbs than a hard court surface, it offers better fall protection and never has to be re-painted! From our offices in Sydney and Brisbane, we are able to advise you on any synthetic sports surface you may require, here are some pictures of our recent work. If you’ve got an old tennis court at your home or resort, then why not take the opportunity to re-Surface-it! Synthetic grass sports courts can be laid over a plethora of existing substrates with minimal base adjustments and there is also scope to add other sports markings to turn your area into a multi-sports arena. 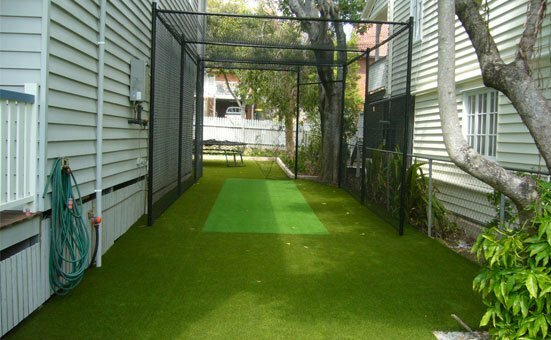 A synthetic grass cricket wicket is surprisingly cost efficient and does away with all of the maintenance requirements associated with the upkeep of a natural wicket. No mowing, no rolling, no fertilising and no watering! Our installers have many years’ experience including laying courts in Europe and across the Pacific, based in Sydney and Brisbane, we understand the needs of the Australian climate and are able to assist you. We also offer full servicing of existing synthetic grass sports surfaces. We specialise in the installation of artificial turf products designed for a variety of sports surfaces. Whether you are building a new facility or upgrading an existing worn-out surface and require removal, uplift, base preparation and installation, we can assist. In Sydney, Brisbane or anywhere on the east coast of Australia, the Surface-it team can advise on the best means of obtaining a finish that will last for years to come and stand up to the rigors that will be meted out with constant and regular activity. Artificial grass sports surfaces will outlast natural grass equivalents, they require less maintenance and upkeep as the surface is manufactured specifically to cope with high traffic and they can be used in most all weather conditions. With a synthetic solution sports clubs and schools are able to use their facilities more often, which can sometimes result in financial gain as a result of more frequent hire charges. 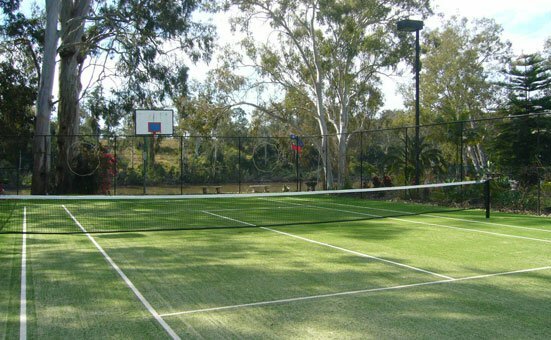 When artificial turf is used playing surfaces can be marked for multiple sports, for example, a tennis court can also be marked for basketball and netball or vice-versa. In summary, artificial turf offers a clean playing area, saves on maintenance and the surface is better for lower limbs over hardcourts. A surface which complements the run of play and cushions a player’s fall is imperative in contact sports, so having an underlay that is appropriate for the sport is part of our service, we can advise on fall protection requirements to lessen the likelihood of injury and the pile height of the turf and the relevant in-fill can be customised to any specific sport. Synthetic turf is the perfect solution for the little white ball! Surface-it offer custom designed putting turf and a unique underlay system to replicate as closely as possible the on-course experience. All of our putting greens are built with improving the game and lowering the handicap in mind, we usually try to include left-to-right, right-to-left, uphill, downhill and flat putts in every green that we build. We have designed and developed putt-putt courses to every budget, from large commercial facilities to even incorporating multiple holes with underground pipes connecting putting areas on different levels for a tiered residential back yard! All of the above utilising the Surface-it custom synthetic putting grass. Multipurpose courts are growing in popularity and can be built in all shapes and sizes. Traditionally a standard tennis court is approximately 35m x 16m or 560m2-600m2 and as mentioned above the court can be marked and used for a number of sports. However, not everyone has this kind of space in their back yard, so at Surface-it we have developed a smaller residential multi-sports package that can be installed on as little as 60m2 and which can be used for basketball or netball with hoops and posts included, or other sports including soccer and hockey practice with goal posts included. Again the sport to be played will usually dictate the type of artificial grass to be used, but we do have a couple of products that will allow for multiple activities. 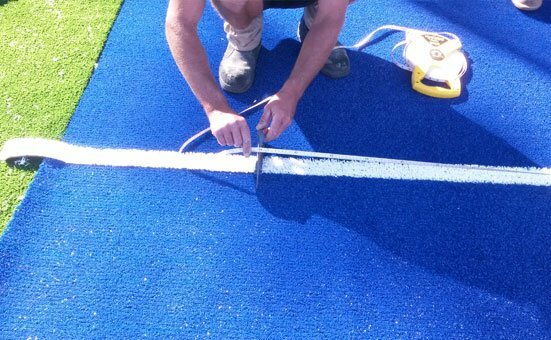 All white lines can be custom installed to suit and if more than one sport requires lines then multiple coloured fake grass lines will be applied. The Surface-it package offered can be as complex or as simple as our client’s requirement, as well as the synthetic turf component, fencing and lighting can also be included in any installation. For tennis courts we offer a range of sand-filled surfaces ranging from our Leisure Tennis surface to our Pro-Hit range all of which offer a variety of speeds and a different playing experience. If you need to replace worn grass or lines on your artificial court or sports area we can assist, there are always certain spots on existing synthetic sports area, goalmouths, service courts and back lines etc. that can wear faster than the remainder of the court depending on usage. Modern artificial grass technology allows, to a certain extent, for cut-ins and cut & paste practices and we are always happy to advise if you require assistance with this. ‘Like for like’ replacement in terms of artificial grass colour is not always possible but we can usually come pretty close! If you need more information, an obligation-free appraisal of existing areas or a full site survey and quotation on new sports installations call one of our local staff in Sydney on 8324 1314, in Brisbane on 3041 4121, e-mail us at info@surface-it.com.au or click here and complete our on-line contact form! Quick and simple and we’ll get right back to you! Artificial grass for sports is certainly the way of the future!